Work keeps you busy, and paying attention to important communications can make the difference between success and failure. Follow the guidelines or regulations for best results. Making adjustments in your schedule to accommodate your personal needs not only gives you time to improve your fitness and health, but increases your efficiency. Your mood is more romantic from the 1st—10th, although you may still feel frustrated by situations from the past which come back to haunt you. You cannot get away with unclear communication, and you will confront anyone whose mixed messages cause confusion. Skirting the issues only complicate things. 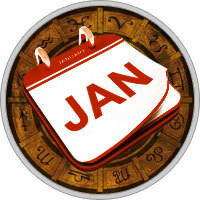 Decide how you feel, and create a commitment that fits the needs of your relationship during the Leo Moon on the 23rd. Contractual agreements or legal proceedings can be highly frustrating, but if you use Mercury's retrograde from the 1st—12th to research the details, then you might be able to reach a workable compromise. New ventures can run into snags due to regulations near the time of the Moon on the 8th, but real progress is on the horizon from the 22nd—31st. Immediately address complaints at work occurring from the 12th—17th to avoid turmoil. Rely on the advice of respected peers or teachers to help you find the path of greatest reward. Talk over matters at lunch or dinner on the 15th, 18th, 19th, or 23rd.